APTA - American Public Transportation Assn. NOTE: Our original article cited an investment cost figure of US$557 million for TriMet's Green Line light rail transit project, a figure reported in a 28 May 2007 article in The Oregonian. TriMet's Public Relations Department have subsequently provided a revised projected investment cost figure of US$575.7 million for the 8.3-mile (13.4-km) Green Line, which would revise the unit cost to about $69 million per mile or $43 million per kilometer. Portland, Oregon's MAX light rail transit (LRT) system passed another ridership milestone this past May – setting a new record of 110,300 average weekday rider-trips, according to a News Release (26 June 2007) from TriMet, the region's transit agency. That's a gain of 5.8 percent over the same period last year (2006). Weekday ridership on the MAX Yellow Line increased 17.2 percent to 13,600 trips. Blue and Red line weekday ridership were up a combined 4.3 percent, according to the release. TriMet's total ridership – bus and rail – also showed an increase, with average weekday boardings on MAX LRT trains and buses combined rising 2.2 percent for the month to a record 326,000 compared to 318,900 trips in May 2006. Weekly fixed-route boardings increased 3.1 percent over last year. Weekend MAX ridership averages were also strong, with 85,400 Saturday and 59,200 Sunday boardings, an increase of 13.3 percent. "We're seeing solid growth on the entire MAX system with tremendous growth on the Yellow Line" said TriMet General Manager Fred Hansen. "One reason for the increase is likely that our riders are looking for an alternative to high fuel prices." Enthusiasm for the successes of TriMet's LRT system has led to further rail expansion projects across the urban area. By far the most important project is the 8.3-mile (13.4-km) MAX LRT Green Line, with 6.5 miles (10.5 km) within the alignment of interstate Route I-205 from the Gateway Transit Center to the Clackamas Town Center (see map at right). The Green Line project will also add LRT operation to Southwest Fifth and Sixth Avenues, between Union Station and Portland State University. The 5th/6th Ave. Mall project is particularly significant because it will feature both large, high-performance LRT trains and buses sharing the mall paveway. 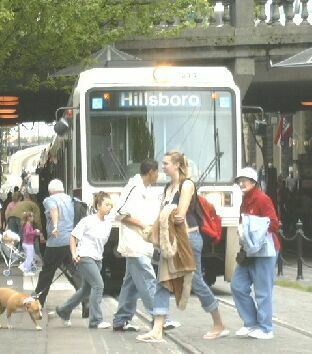 TriMet expects that bus services will return to the mall in the spring of 2009, with LRT service opening six months later, according to a report in The Oregonian (29 June 2006). Construction of both major segments of the project – the 6.5-mile I-205 section and the downtown transit mall section – is well under way, with much of the freeway section work taking place within an existing transitway easement adjacent to I-205. This portion of the project includes the construction of seven bridges and one undercrossing to allow trains to run in a separate right-of-way. The I-205 segment will have eight new stations and five Park & Ride lots, providing a combined 2,300 parking spaces. Portland's Green Line project will include a fleet of new Siemens S70/Avanto 70% lowfloor LRT cars – longer, wider, and with more seats. Each two-car train is designed to carry up to 464 passengers, compared with 332 on current rolling stock. Meanwhile, reconstruction of downtown Portland's transit mall to enable LRT operation along with buses is coming along "right on track", according to a 28 May article in The Oregonian. Nearly six months after the buses left [i.e., were re-routed to permit the construction], the new downtown transit mall is taking visible shape. Light-rail tracks run down the middle of 16 blocks on Fifth Avenue, and several intersections sport the new brick paving. The project designed to breathe new life into the 30-year-old mall and add light rail is on schedule and by all accounts going well. Reconstruction of Portland's downtown transit mall to enable joint use by Green Line LRT trains and buses is well under way. "Many people, including TriMet officials, feared the bus relocation would spawn chaos, but it hasn't" reports the paper. "And the mall, even under construction, is cleaner and quieter than it was when the buses rumbled down Fifth and Sixth avenues" according to Greg Goodman, described as a major real estate developer "whose family is the largest private downtown landowner". In fact, reports The Oregonian, the nominally temporary relocation of buses off the mall during construction, and onto Third and Fourth Avenues, is working so well that there is some interest in relocating bus services to those streets permanently. Green Line LRT trains will share operation with buses on Portland's downtown transit mall. However, it's likely that at least most bus service will remain on the current transit mall after LRT construction, since the mall is designed for both buses and MAX trains to coexist. "Both will stop on the right-hand side of the street" notes The Oregonian. "The rail tracks curve to the curb as each train approaches each station. 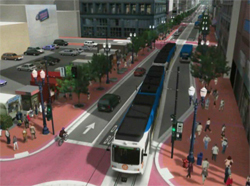 Without buses, the light rail could go straight down the street." Simulated overhead view of LRT train on Portland's rebuilt downtown transit mall.